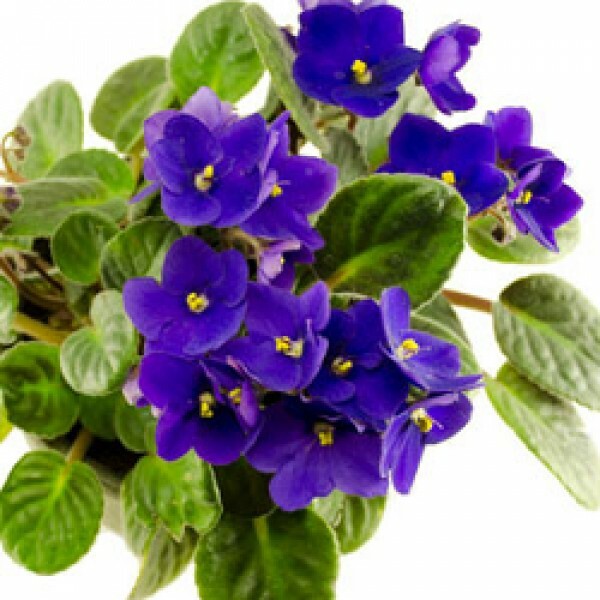 Saintpaulias, commonly known as African violets, are a genus of 6–20 species of herbaceous perennial flowering plants in the family Gesneriaceae, native to Tanzania and adjacent southeastern Kenya in eastern tropical Africa. Typically the African violet is a common household indoor plant but can also be an outdoor plant. Several of the species and subspecies are endangered, and many more are threatened, due to their native cloud forest habitats being cleared for agriculture. Saintpaulias grow from 6–15 cm tall and can be anywhere from 6–30 cm wide. The leaves are rounded to oval, 2.5–8.5 cm long with a 2–10 cm petiole, finely hairy, and have a fleshy texture. The flowers are 2–3 cm in diameter, with a five-lobed velvety corolla ("petals"), and grow in clusters of 3–10 or more on slender stalks called peduncles. Wild species can have violet, purple, pale blue, or white flowers. Saintpaulias are highly sensitive to temperature changes, especially rapid leaf cooling. Spilling cold water on African violet leaves causes discoloration. This is thought to be because rapid leaf cooling causes cell vacuole collapse in the palisade mesophyll cells. African violets are commonly propagated asexually. Plants can be divided into smaller daughter plants or even grown from leaf cuttings. Growing African violets from seed is rare and most commercially available plants are produced from cuttings and tissue culture. Saintpaulias are native to eastern tropical Africa. There is a concentration of species in the Nguru mountains of Tanzania. The plants get their common name "African violet" from their superficial resemblance to true violets (Viola, family Violaceae). The genus is named after Baron Walter von Saint Paul-Illaire (1860–1910), the district commissioner of Tanga province who discovered the plant in Tanganyika (now Tanzania) in Africa in 1892 and sent seeds back to his father, an amateur botanist in Germany. Two British plant enthusiasts, Sir John Kirk and Reverend W.E. Taylor, had earlier collected and submitted specimens to the Royal Botanic Gardens, Kew, in 1884 and 1887 respectively, but the quality of specimens was insufficient to permit scientific description at that time. The genus Saintpaulia, and original species S. ionantha, were scientifically described by H. Wendland in 1893. Revisions of the genus by B.L. Burtt expanded the genus to approximately 20 species. Due to recent studies which showed most of the species to be very poorly differentiated, both genetically and morphologically, the number of species has been reduced to six, with the majority of former species reduced to subspecies under S. ionantha, in a recent floristic treatment. As of 2009, 9 species, 8 subspecies, and 2 varieties have been recognized. Plant's height approximatily 9inch and pot size is 5 inches.